The kingpin of the 2019 free agency season has fallen on day one, and the Detroit Lions are the beneficiaries. Trey Flowers has agreed to a deal to reunite with former defensive coordinator Matt Patricia to give the Lions some much-needed pass-rushing help. From a scheme, talent, and need perspective, this is a home run. The first thing you need to know about this deal is that Flowers is good. Very, very good. Whether it’s rushing the passer or playing the run, Flowers can do both at a high-level. His length and size makes him wholly capable of playing pretty much any alignment on the defensive line. In fact, he pretty much did in 2018. He took 43 snaps in the A gaps, 133 in the B, 63 lined up over the tackle and 479 out wide last year. And from there he produced. 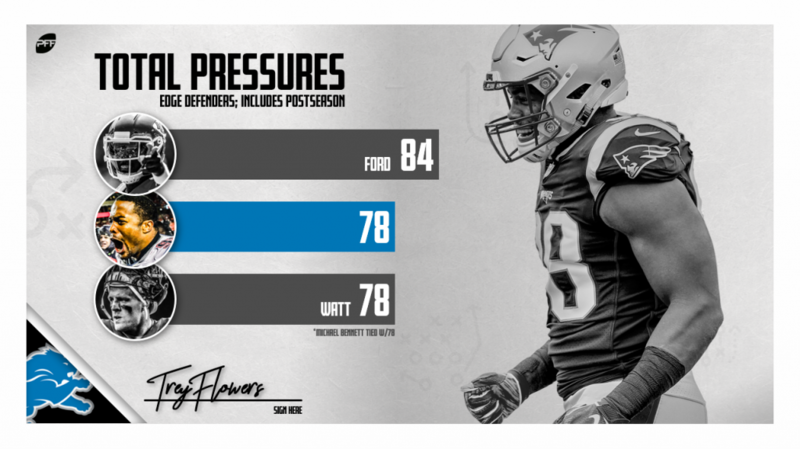 Flowers racked up 78 total pressures on 581 pass-rushing snaps including the playoffs. He notched 32 run stops on 282 snaps against the run, as well. His 89.7 overall grade was one of the best at the position in the NFL. Compared to Lions starters Romeo Okwara (64.0) and Devon Kennard (62.2), it’s night and day. The cost is steep, but a 25-year-old who has gotten better every single season of his NFL career, Flowers’ price wasn’t going to be cheap. There’s no reason to think he won’t be one of the most productive edge players in the league over the life of the deal.